"Fling-It" A cover for one or more garbage bags comprising a fling-on cover made of material selected for its ability to deter pests including crows and seagulls. The COVER has an open end that is provided with a drawstring, the drawstring being provided with a tightening device to permit a person to tighten the drawstring around the lower part of the garbage bags. The tightening device releases the drawstring as the bag is lifted from the garbage bag. 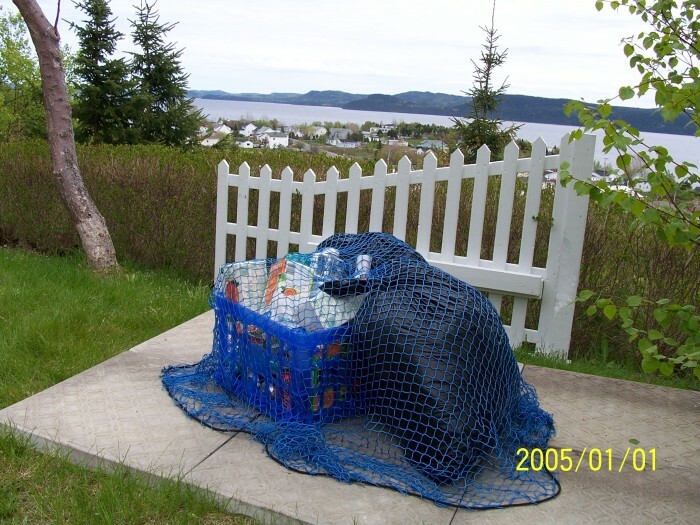 "Fling-It" is designed to cover residential curbside garbager while it awaiting pick up by the collectors. This cover solves the on going problems of litter scattered around the street by crows, seagulls and the wind. 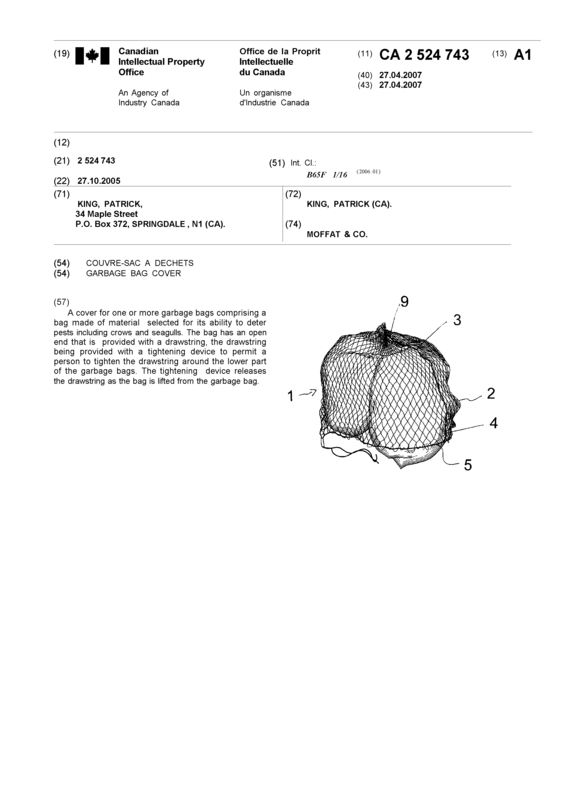 I am interested in selling this patent and all other related intellectual property such as trademark, website, sample inventory, tools, instructions and all related information necessary to manufacture and sell this proven product. This product is ready to take to a much larger market NOW. Anyone who has seen residential litter scattered around the neigbourhood by seagulls, crows and the wind will recognize its potential. 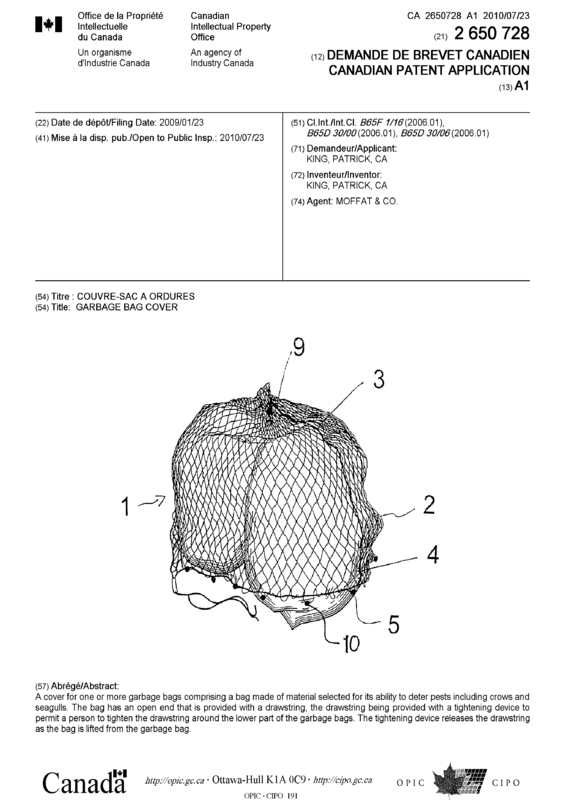 Page created at 2019-04-25 3:59:58, Patent Auction Time.